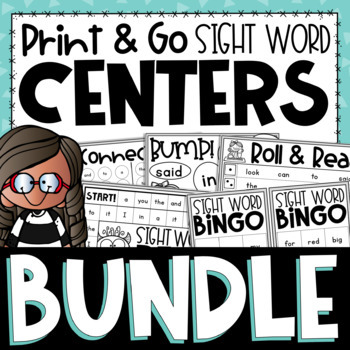 In this bundle of Dolch Sight Word Printables, your students can practice Dolch words in engaging ways without spending hours prepping centers. I use these in my small groups with an assistant or myself as well. Connect Four: This center includes printable pages to use to practice four sight words at a time. I also grouped these four words based on frequency, so you'll see them grouped with words of similar size and frequency used. Roll & Read: In this center, you'll find printables with twenty-four words to review on each page. These words are not grouped based on frequency, but rather a mix of each set of Dolch words to help students review all words.